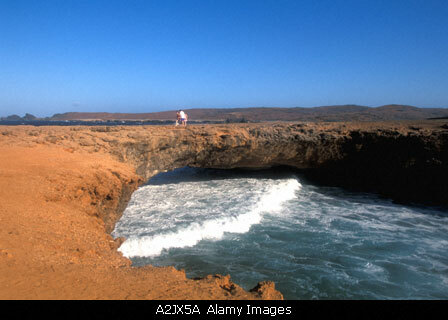 The next time you're in Aruba, you won't be able to stand on its landmark 100-foot long, 25-foot high Natural Bridge, largest in the Caribbean. It collapsed before dawn on Friday September, 2005, not from any terrorist bomb but the apparent victim of old age. A snack bar vendor reported a crack had appeared in one end of the bridge several years ago. The same forces that created the Natural Bridge--strong winds and waves carving it out of the coral limestone rock over thousands of years--also weakened it. 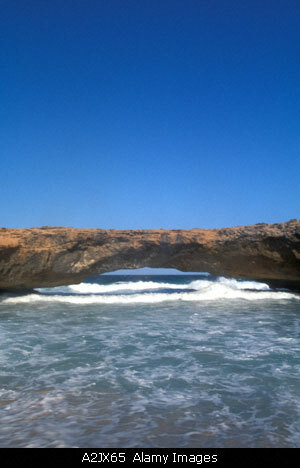 But Aruba has more natural bridges to show tourists. One of them, considerably shorter, is next to the one that fell down. "We have lost the mother. But we still have the daughter," that same vendor told the Associated Press. Still, it won't be quite the same for those who were fond of the more impressive mother. Those who never saw the grand old girl still standing will probably like the substitute just fine. To The Mother of All Caribbean Natural Bridges: RIP.